What better way to mark a special occasion than with a bottle of fine Champagne – sliced open with a sabre! The Milestone Hotel in Kensington has its very own in-house Master Sabreur, Fabrizio Russo, who is keeping the old tradition of Sabrage alive with a dedicated Art of Sabrage experience. Fabrizio demonstrates to guests (both resident and non-resident) how to open a bottle of Champagne with a sabre – see a video of Fabrizio in action here. Guests then have the opportunity to open their own bottle, after which they receive a certificate of the event and a delicious three course meal from the à la carte menu. Sister hotel in Bloomsbury, The Montague on the Gardens celebrates the Art of Sabrage with a special Sabrage Afternoon Tea, and the five-star Hotel 41 in the heart of London also offers lessons in the old tradition. 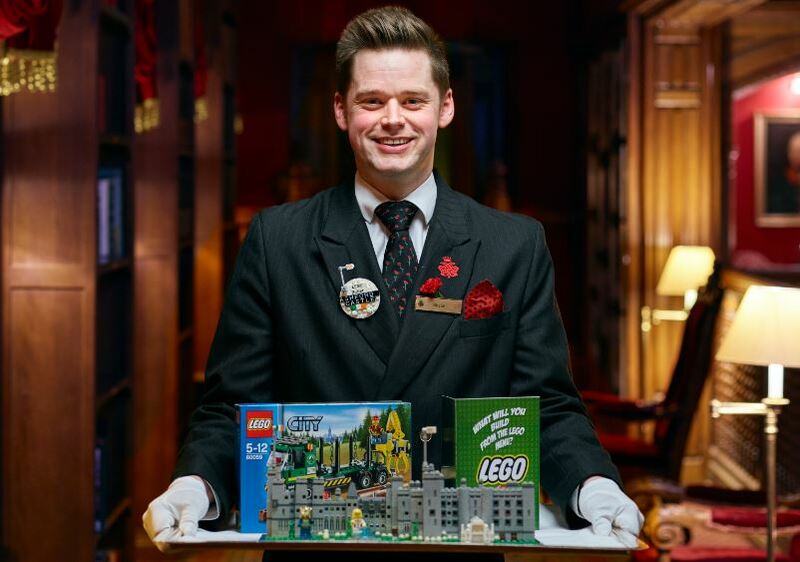 Children staying at the magical and historical Ashford Castle in Ireland will be delighted by the services of their very own Lego Butler – fully attired in white gloves and a silver tray presenting a selection of Lego sets. Order pieces from the in-room Lego Menu and the building blocks will be delivered right to the door so kids can create their own castle. A holiday at Ashford Castle is sure to be an experience the kids will never forget, especially because they can take the specially delivered Lego set home with them at the end of their stay. No need for Chesterfield Mayfair guests to worry about food miles when they spread honey on their toast in the morning – it will only have travelled from the roof right above them! The in-house Beekeeper at the five-star London hotel tends to four hives installed on the roof of the building, each housing about 120,000 bees during high summer, with eggs, larva and honey. The bees fly within a radius of around three miles which encompasses Buckingham Palace, Clarence House, St James’s Palace, St James’s Park, Green Park and Hyde Park, as well as any number of private gardens. The Chesterfield Bees produce one crop a year which the beekeeper harvests during the summer. The amount of honey produced depends upon the weather but the hotel aims for about 160lbs, enough to spread on mountains of hot toast every morning. Furry guests at TripAdvisor’s number one rated hotel in London will be pampered from the moment they arrive – the hotel takes their VIP (Very Important Pet) guests very seriously. Hotel 41’s dedicated Pet Concierge ensures all pets are not just welcomed but have the time of their lives by catering to the animals’ needs in every way imaginable. The ‘Pet Preference Form’, completed by guests prior to arrival, makes note of things such as preferred pet food, favorite toys and bedding arrangements. The Pet Concierge will prepare the guests’ room with a choice of custom-made 41 pet beds, a ‘Do Not Disturb, Pet Sleeping’ card, food and water bowl with fresh mineral water, a dedicated pet menu, a turndown treat and a tailor made welcome hamper featuring a delicious doggy treat, toy, welcome letter and 41 dog tag. The Pet Concierge can also provide dog sitting and walking services, pet bathrobes, grooming services and even birthday celebrations — all the pet necessities for any precious pooch. All 17 hotels across the collection are pet friendly so furry friends will receive the royal treatment no matter where they stay. 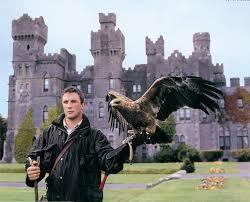 The oldest established Falconry School in Ireland is situated on the picturesque grounds of Ashford Castle in County Mayo. The Castle’s Hawk Walkers (and no, we’re not referring to a freaky Game of Thrones character) share the excitement of falconry with guests; a fascinating ‘sport’ that has enthralled people for 4,000 years, and today Ashford gives guests the opportunity to take a hawk for a walk in the spectacular castle grounds. After you’ve been introduced to your Harris Hawk (the friendliest bird of prey you’ll ever meet), participants set off into the magnificent woodlands to fly the birds, as they follow you from tree to tree through the woods before swooping down to land on your gloved fist. The Hawk Walker enlightens guests on the hawks’ exceptional eyesight, their speed and agility and how they were trained by the Falconry School themselves. 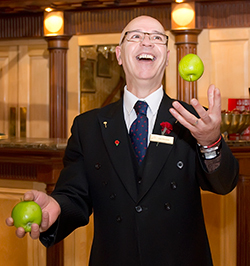 John Goncalves has been at The Rubens for 34 years and knows everything there is to know about the hotel and local area – so there’s no one better to fill the role of the hotel’s official Director of Fun and Adventure! John will tell kids all about the secrets of the building and the comings and goings at the hotel – you’ll be impressed at the number of times he’s seen the Queen drive past! A true professional and big kid at heart, John is dedicated to keeping little ones entertained and is on hand to recommend the best local attractions and arrange tickets to the latest events. Budding Master Chefs will love The Rubens Pastry Experience which involves kitting kids out in chef whites, taking them on a tour of the hotel kitchen, and decorating cupcakes with the resident Pastry Chef. The luxurious five-star London town house, The Egerton House Hotel, is on the doorstep of some of the world’s leading museums and galleries such as the famed Victoria and Albert Museum. However, the hotel also showcases a private collection of internationally acclaimed artists from the 19th and 20th Centuries. The works have been assembled over several years by the Founder and President of Red Carnation Hotels, Beatrice Tollman, and are showcased to guests by the hotel’s Interior Art Expert, Jacques Conradie. A collection of lithographs by the likes of Henri Toulouse Lautrec adorn the hotel’s reception, Picasso and Henri Matisse are on show in some the hotels’ rooms and suites, and a “Snoopy” pencil drawing by creator Charles Schultz takes pride of place in The Bar. The tranquil waters of Lough Corrib and its many beautiful islands is the enviable office space of Frank Costello, the Orvis endorsed Ghillie (fishing guide) at Ashford Castle in Ireland. Like his father and grandfather before him, Frank has lived by Lough Corrib his entire life and is internationally recognised as one of the most knowledgeable experts on fishing in the area. From fly fishing to half and full day excursions on the lake, guests of the Castle can join the local Ghillie on one of his hand-crafted boats for a truly Irish experience. Those that opt for a full day excursion will enjoy a delicious picnic lunch on one of the islands, and even the chance to take your catch back to the Castle where the Chef will cook it for your dinner. The resident mixologists at the The Chesterfield Mayfair Terrace Bar are always looking at ways to innovate, and create refreshing and delicious cocktails from every combination of ingredients imaginable. Forget about a boring old gin and tonic, The Chesterfield mixologists have taken the highball cocktail classic and given it a fresh twist to demonstrate the true depth and diversity of the drink, with an interactive Gin Experience. Four sensational tasting menus provide guests with the opportunity to sample selected gins, ranging from citrus to floral and savoury to spiced, accompanied by a range of tonic waters and botanicals that transform the flavors of this much beloved beverage. The hotel’s mixologists have also been busy creating a brand new collection of molecular cocktails, embracing science and technology to present new and innovative ways to experience your favorite spirits, and an all-new Whisky Experience too – watch this space! Located at the foothills of the Cederberg Mountains in South Africa, only 270km from Cape Town, guests staying at Bushmans Kloof Wilderness Reserve and Wellness Retreat can reconnect with their inner selves and the essence of life amidst a haven of staggering beauty and timeless tranquillity. The Bushmans Kloof Field Guide takes guests on the Reserve’s renowned Nature Drives and Rock Art excursions, introducing them to a world of wide open plains, abundant wildlife and majestic rock formations. 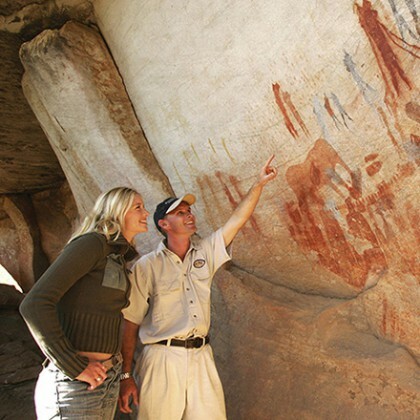 Considered mankind’s oldest nation, the Bushman lived in the Cederberg Mountains for a millennia. The Field Guide enlightens guests with insights into the ancient culture and interpretations of the paintings on rocky overhangs, many dating back over 10,000 years. For more information about these award-winning hotels and the rest of the Red Carnation Collection, go to http://www.redcarnation.com.